8 years ago, early on in my TNT adventures in Hi-Fi, I unpacked one component I'd really been looking forward to getting my hands on – the SME IV pick-up arm. The reasons for my excitement were pretty simple – here was a basic version of that iconic arm – the SME V - which in many ways had started the 'Superarm' revolution, upping what people were prepared to pay, and what they would expect in terms of performance. 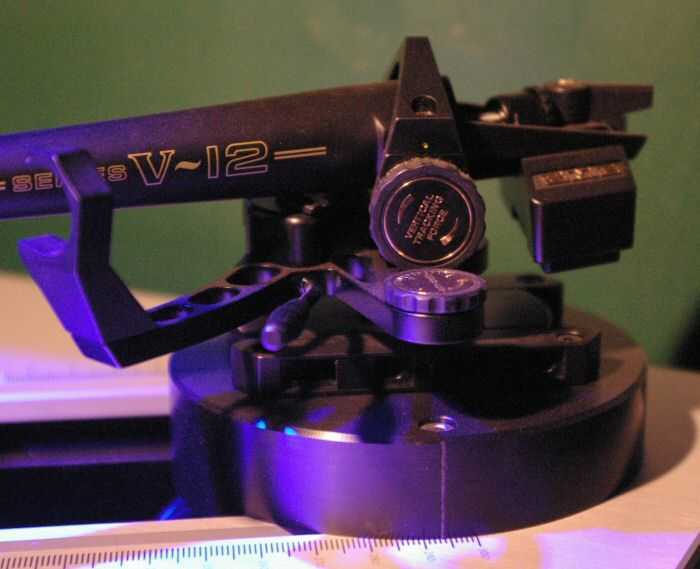 It also introduced the cast Magnesium arm-tube, that provided more stiffness and lack of boundaries than those used by almost every other manufacturer (even better than the Rega arms with their cast Aluminium tube). As we are lucky to be blessed with the flexibility of the internet, you can just read that original review – dealing with a bit more of the history - here, and so save me from a lot of repetition (and typing). In the end I bought the review sample and for the next 6 years it gave sterling and faultless service as my main review arm, including being part of the reference analogue source (on an Orbe) for my turntable reviews. But all good things come to an end, and after a particularly vicious assault by the taxman I sold both Orbe and SME IV. In the meantime SME had been busy introducing variations on the V theme – all simplified to hit lower price points and most using an aluminium arm-tube featuring a detachable headshell. One of these variations was the 312, a 12" arm. The thing was that with the success of the 312, SME saw that there was a market for a better 12" arm. Now SME have made a 12" arm or two for much of their history. To make a fabricated tube 2 or 3 inches longer isn't that difficult. To produce a pressure cast arm-tube, as used on the flagship V was more difficult, requiring new moulds. 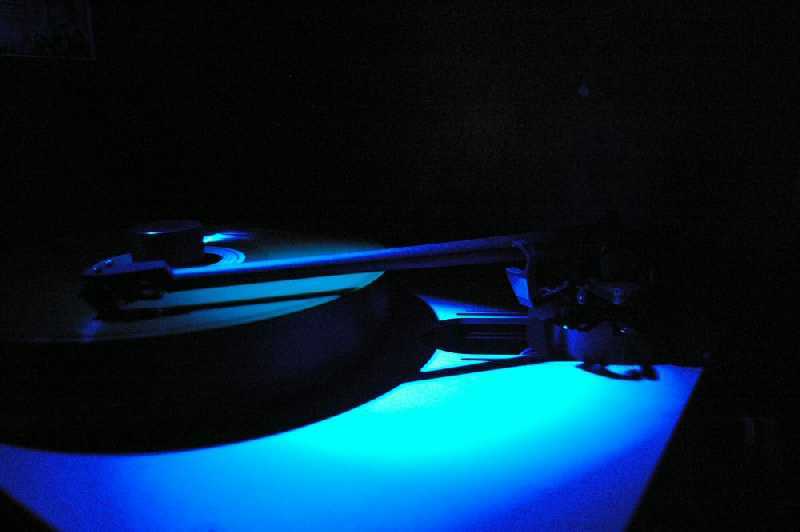 It also meant either that the new flagship wouldn't fit their own turntables, or that a new top turntable had to be produced – in all quite an investment. And now that arm is available for purchase for use on any suitable turntable. In fact that's the wrong question. It's self evident that a longer arm will better approximate the straight path of the original cutting lathe and thus show lower levels of angular error and distortion – as much as 27% less (see graph). It'll also mean VTA will alter less over warps. So the real question is 'why not'? Well though it sounds a bit odd, the single biggest reason is that for a long time hardly any turntable would take them. In the 50's and early 60's - when turntables were just that, a motor unit you fitted into your own plinth a la Garrard 301, Thorens 124 et al - fitting a 12" arm was simplicity itself and regarded as the best option. But during the 60's the suspended table took over, culminating in the Linn LP12 that utterly dominated the turntable market. And none of these tables, Roksan, Pink, Michell, Thorens, Heybrook, Ariston, Oracle etc etc etc would take a 12" arm. In fact pretty much the only people still using them were those wedded to the old classic separate motor units. Why did none of them offer a 12" version? Well for one, having a heavy weight, well out to one side of the suspension would make tuning such a system much more difficult. It also meant that these (generally small) manufacturers would have to offer a second version of their turntable, suitable for a 12" arm. With a solid plinth design, that means just cutting a bigger hunk of wood – with a suspended design it would mean a completely different chassis, different suspension etc, and in many cases (e.g. Michell and Oracle) a rather different aesthetic. Lastly a turntable suitable for a 12" arm was likely to be considerably larger and less domestically acceptable – in particular, too big for many supports. Whilst this alone accounted for the almost complete disappearance of the 12" arm, it also meant that all those manufacturers then had a vested interest in running the 12" arm down – after all, they were saying that the 9" arm was as much as you needed – so what were these arguments? 1 – Stiffness. Inevitably a longer tube will be less stiff than shorter one - all things being equal. The thing is though, that with modern materials like carbon fibre and one-piece armtubes made of Magnesium, Aluminium and Titanium the levels of stiffness have gone up a long way, perhaps to a point where it simply isn't an issue. 2 – Is a 12" even necessary. The argument is that the misalignment due to angular error in a 9" arm is already inaudible so why bother with anything longer? The snag is that now, unlike the 60's, all quality cartridges are fitted with complex line-contact styli that are designed to sit exactly in the groove – any misalignment will effect that 'seating', in fact is even 12" enough? And are modern systems capable of a level of resolution that exposes such angular errors in a way that simply wasn't an issue in the golden age of the LP12? In a world where people claim to be able to hear errors of hundredths of a degree in VTA it has to at least be considered. 3 – A longer arm will resonate at a lower frequency – even a couple of tones down. One aim of arm design has been to get the primary resonance of an arm as high as possible, in the case of the best arms as high as 1 kHz. This is supposed to reduce the audibility of said resonance to take it out of the midband. Does a small lowering of this frequency matter in the context of arms with excellent resonance characteristics? 4 – Effective Mass. This is one of the most misquoted and misused of arm parameters. The argument goes that the 12" arm, in moving the mass of the cartridge and headshell 30% further away from the pivot, the inertia and therefore the Effective Mass will rise significantly. To offset this the armtube and headshell must have mass cropped from them and thus be even more compromised in terms of stiffness. When applied to an arm it means that the most significant contribution to a tonearm's Effective Mass in use, is usually the cartridge itself. So for example if we take an arm with a typical Effective Mass of say 12 grms, then add a cartridge weighing 10 grms we'll end up with a total Effective Mass of 22 grms. A 12" version of the same arm will probably be around 13 grms Effective Mass, giving a total of 23 grms. That's going to have little or no effect on the resonance performance, or warp riding ability. What all this adds up to is this – are marginal and possibly insignificant differences in stiffness, resonance and effective mass enough to offset an theoretical improvement in lateral alignment of over 25%? One other possible effect (that I've just thought of) is that energy from the cartridge will pass into a longer and more massy armtube, which may also have an effect re the amount of energy that is reflected back to the cartridge (and thence to the system) and the delay of said energy. SME has been the benchmark for build quality for as long as I can remember. Fit, finish, aesthetics are as good as it gets. The beautiful clip with its roller to hold the arm at rest does mark the black finish over time, but not too badly. Otherwise the V12 is everything you'd expect. It's expensive yes, but then so is a Rolex or a Porsche. The piece de resistance is of course the new cast magnesium armtube. Like the Rega arm this is pressure cast (though the Rega is Aluminium), but unlike Rega, once the armtube is cast, the headshell produced is a blank requiring further machining. This enables SME to precisely control the shape and weight of the headshell and it's offset. As with all V's and IV's this armtube extends from the tip of the headshell, incorporates the bearing housing, and continues to form the mount for the counterweight. This is unique and means that vibrations produced in the cartridge have an uninterrupted path to the bearing housing, and likewise there are no joints to add resonances (rattling if you like:-) This integrity seems simple, but production is far more difficult and more expensive to set up than a conventional glued and/or screwed fabricated arm. Only when larger volumes are produced does it become economic, which is why big manufacturers like Rega and SME do it where others don't. Of course such a one-piece armtube design is going to be stiffer, especially as the complex taper of the V12 makes the best use of the material, with much of the mass right by the pivot where it's effect on Effective Mass is minimal and the required stiffness at its greatest. A conventional armtube has the same cross-section throughout its length – so that the wall-thickness and diameter has to be a compromise between effective mass, and required stiffness. The V12 design simply does away with this. As you'd expect the bearings are top quality with no noticeable friction or play. The counterweight is extremely unusual as not only is it slung directly under the armtube, it takes the form of a box-like carrier within which are a series of weights. Normally only one large weight is used, but in order to balance heavier cartridges other weights can easily be added by the owner – this also allows fine tuning of Effective Mass for the obsessives, as of course the heavier the weight, the closer it is to the bearings and thus the lower the overall Effective Mass. Setting it up is a doddle because the arm mount allows the arm top be racked back and forth to obtain perfect overhang – this made easier by a simple template that guarantees exact alignment – verified by using the PROtractor. This system allows the headshell to do away with conventional slots which enable other arms to fine adjust the overhang – the SME solution being neater and stiffer. The V12 also offers adjustable damping – not of the big-bath-of-gloop to stop a unipivot wobbling about, but a small trough with a paddle right up with the bearings that can be raised or lowered as an additional sink for vibrations. The supplied arm cable is a high quality silver VdH jobbie and of course SME add all the nuts and bolts and tools you might need. Lastly, before I leave this section, it is of relevance that here is a product from a long established company with a serious reputation for service and back-up. Buying a wonder arm from some guy with a fabulous design and a lathe in his garage does have it's attractions, but then so does buying something that you know will be supported with servicing, repairs and updates (often third-party) decades into the future. Personally both options draw me, but the SME will always be a safe buy. This is reflected by the fact that 40 year-old SME arms are still fetching more than they cost new – that may make this review worryingly like some consumer report, but it would be being economical with the truth not to point out the situation. Well as I said in the introduction, the single most likely reason for the near extinction of the 12" arm from the 70's to the late 90's was the almost total lack of turntables that would accommodate them. Well it seems ironic that in the last ten years the suspended turntable has lost it's ascendency to be replaced by a plethora of solid plinth designs of all shapes and sizes. 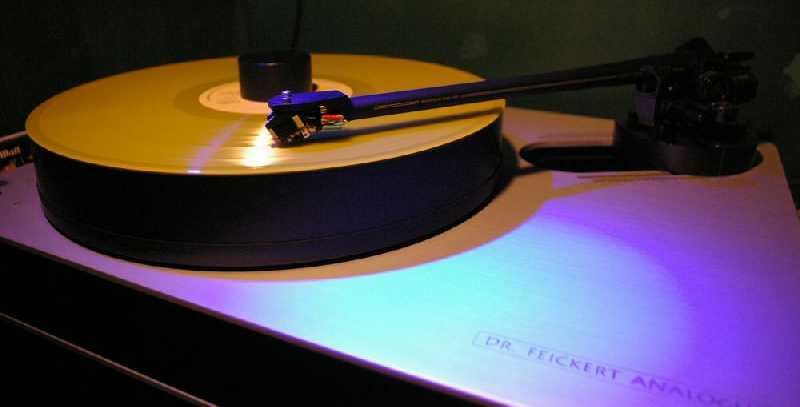 So I find that when the V12 crossed the threshold of Husband Towers there were no fewer than three high-end turntables lying in wait to stake their claim as a partner – the Opera Audio LP5.0, the Acoustic Solid Solid-Machine and hot off the presses, Dr Feickert's new Woodpecker. We'll as the LP 5.0 actually belongs to me it seemed only fair to bolt the SME on to it first. The combination was gorgeous to look at – the wood and black alloy of the LP 5.0 matching perfectly, and the sheer size of the turntable made the SME look in proportion rather than looking a little 'distant' from the platter. The V12 replaced my own Dynavector 507 MkII, and as befits a top quality arm I also swapped over the Dynavector DRT-1s that I usually use. A heavy and bulky cartridge, the DRT-1s fitted without any problems and the set-up procedure lasted no longer than 20 minutes before I played some music. I'd been having some problems with the LP 5.0 as I was trying out a new AC motor unit/power supply which was designed to be less temperature dependent than the DC motor that came originally. The DC motor was clearly superior, with a far more open and clean presentation regardless of the fact that I had to adjust the speed if the bearing was cold. The AC motor was plagued with motor breakthrough, exciting the thick alloy plate that formed the upper chassis and bearing mount. With Opera's new 12" arm (review to follow) this was bad enough to kick off some major arm resonances. The SME had no such problems, and though the AC motor was quickly discarded it did show the big advantage the SME armtube had over the rather whippy and low mass Opera effort. I'm not a great believer in cables and their fundamental effect, but here I was in for a surprise. Being lazy, and not wanting to faff about untangling the birds-nest of wires that stood between the LP 5.0 and the Lehmann Black Cube SE, I simply used the cable I'd had on the 507 – this one in fact. The result was very promising so as everything seemed to be working I swapped to the SME supplied cable. Good grief what a difference! The presentation was much more forward, brighter and faster – really pushing detail and leading edges to the fore – and to be honest a little over the top for my personal tastes. This was not a minor tweak – it was a full blooded change of tonal balance. Then of course as always I became more used to the tonal balance and everything seemed to settle down. Over the next three months I've swapped around with cables and not once been able to replicate this startling change and can only conclude that either I was imagining things, or that the cable needs to be burnt in. In 10 years of reviewing I've never heard such a stark demonstration of the phenomenon but unless SME send me a handful of new cables to repeat the experiment I'll never know for sure, but if you too hear the same thing and discard the SME cable, I can only suggest you grin and bear it for a week to see if it settles down. Once this break-in period was complete the VdH cable remained one of the brighter and more open/detailed of the breed, but to a more sane extent. It's interesting that SME supply a cable, that rather than trying to be all-things-to-all-men is biased to one side of the spectrum. This may be because it works best with the character of SME turntables, or that it's just what SME think is correct, but if you buy the V12 and after a decent time find that its presentation is just a tadge too bright, a less forthright cable would solve the problem. In my case, and a little to my surprise, I found that I preferred the SME cable on two of the available turntables (the LP 5.0 and Woodpecker) to all available competition. I suppose that I shouldn't have been surprised that the V12 reminded me strongly of my old IV – together with that arm it demonstrated a supreme unflappability with all music types. Right now I'm listening to the blistering sax runs of John Coltrane – an hour ago it was the guitar of Jimmy Page and earlier still the percussive piano of Thelonious Monk – all handled with utter aplomb. The feeling being one of utter control, never singing-along-with-the-tune, but open and clear without bloom or overhang, and all the time underpinned with a tuneful and very tight bass performance. In fact it's difficult to describe the character of the top SME's, because, beyond the slightly forward nature of the cabling, they don't seem to have any. They lack the mellifluous flow of a Triplanar or a Morsiani, but counter it with a lack of artifice that does mean they handle all forms of music, from a slice of Handel to a slab of AC/DC with equal insouciance. Nothing demonstrated this better than the effect of changing the arm between turntables. In each case the result was that the character of the turntable came through. From the power and warmth of the LP 5.0 I went to the Solid Machine, and was rewarded with a lighter, tighter presentation, sounding smaller, but a little sweeter and quicker on its feet. The real surprise was the Woodpecker – a design unlike the other two in that it emulated the conventional suspended plinth style (though it's a solid base) and yet manages to accommodate 12" arms with ease, and with it's graduated, sliding arm-base makes setting such arms up – even those lacking an SME style base – an absolute pleasure. 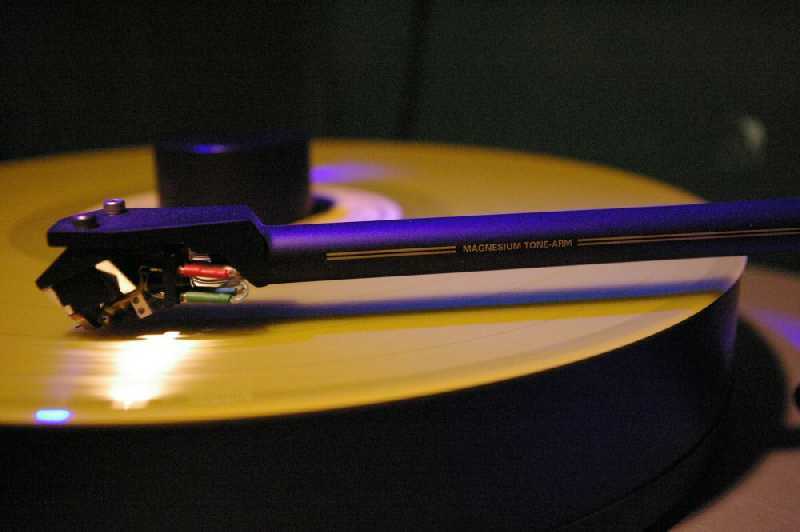 This turntable retails at around 3000 Euro, and for those unable to afford the SME turntables it would seem to me to be a superb choice – both visually and sonically - for the SME V12. On the Woodpecker the combination took a small step back from the very best in terms of resolution and openness, but performed faultlessly in other areas. I've stated several times that my ears are very far from 'golden' (at nearly 50 what else would you expect? ), but I'm very fussy when it comes to faults – distortion, bloom, harsh treble, single-note-base etc and I can hardly bear to be in the room with the stuff. With the Woodpecker I just forgot about the system and enjoyed the ride. This is tough. The V12 is the top arm produced by a company that claims 'the Worlds Finest pick-up arm'... That phrase is open to a lot of interpretation and of course personal taste. We've covered the world-class fit and finish, long term reliability, servicing and back-up – all of which are unlikely to be bettered. But when it comes to sound quality, or perhaps more correctly 'accuracy', things are more difficult. I've heard several of the major contenders to the throne, but in all honesty I doubt I've heard more than 20% of the available competition, and for me to pronounce the SME V12 the best in the world would be foolish indeed. My old Dynavector 507 matched the build quality and gave a similar unflappable performance but ultimately lacked the last word in detail and soundstaging. But it did have an ease and flow that sometimes left the SME feeling a little clinical. And here we come down to personal taste and system matching. Arm's like the Triplanar and Morsiani in particular offer a slightly more rose-tinted view of the music. If you want something that hunts down leading edges and makes everything sound exciting then the Roksan Artemiz will leave you breathless, though the V12 with it's supplied cable comes very close whilst filling in the body of the music. The Conductor air-bearing arm is just so holographic it pulls ahead of the SME, but is left trailing when it comes to power and dynamics. You get the idea... No arm will suit every taste and system. But a top arm has to do everything well, and several things brilliantly and there's no doubt that the V12 fits the bill. So... What does it do 'well'? It soundstages like a good 'un, posting big believable images into a three dimensional soundscape. These images are solid, fixed and unwavering (on the Woodpecker in particular). They're not ethereal 'ghosts', nor do you feel you can walk about the soundstage, but it does sound like real musicians. Detail too is of a very high standard, but it manages to produce this without emphasising leading edges or sounding 'pushy'. Treble is open and clear and integrates seamlessly with the midband. So what does it do brilliantly? All of the SME's stand-out characteristics come from that low-colouration design. The bass is just so clean, so deep and with so little overhang it can make some arms feel short-changed and others bloated. The midband, especially when exposed by female vocal is utterly without that 'aw' colouration that plagues systems trying to play singers like Mary Chapin Carpenter, or Joni Mitchel – voices that seem to wind up resonances in systems like no other. This then gives space for the timing of the music to breath in a natural way. 'Charming' arms (and systems) seem to be so keen to add texture to everything that the essential rhythm of a piece is lost – the SME manages to keep everything in place, much as an EKOS does, though that worthy design, with it's truly seismic bass does seem to lose out to the SME when it comes to fine detail and microdynamics. But for me, the real stand-out quality of the best SME arms is their coherence and even-handedness with all types of music. To say something is 'faultless' implies perfection and I'm not claiming that at all, it's just that the SME V12 shows no weaknesses that intrude on the music. And here I'm deeply uncomfortable. I'm nobodies guru, and I've stated before I can't hear the difference 0.01mm of VTA makes to the fidelity of a record. And having gone out on a limb in opposing some of the more hair-shirt aspects of the Hi-Fi religion, I'm at a bit of a loss to explain why, for me, 12" arms appear to show a convincing superiority when it comes to fidelity across the disc. And it's that point where those discs that sound the most edgy - ¾ of the way from the edge – where the 12 inchers seem to have the biggest advantage, and that's precisely where angular distortion is at its greatest. So big deal, a 12" arm shows a 27% improvement in lateral alignment, but 27% of bugger all is still bugger all... So why do I find that 12" arms play some records that I'd considered too worn and prone to misstracking without breaking sweat. I'm not just talking about the SME here, I've a couple of different (very different) Opera 12" arms here, and though the V12 is clearly superior they share this ability to make you forget where on the disc a particular track is. This bugs me. Can that small increase in lateral angle accuracy really make that much of a difference? Surely the 9" arms are close enough? – but then I guess we're talking about a bigger angular misalignment than the VTA pundits claim so maybe? Angular misalignment will mean that one channel of the stereo signal will be played fractionally before the other – adding phase distortion? Which all sounds entirely credible, until you realise that that assumes that you've aligned the cartridge to perfection in the first place – with an accuracy of a fraction of a degree. Maybe I'm better at this than I realise, but generally I'm one of the 'line-it-up-and-play-music' school, and as styli are routinely 1 or more degrees out of alignment (yes even on high-end exotics) this is going to be hit-or-miss at best. And yet – and yet the 12" arms I've had here seem to just pull this trick every time. Is it that something else is going on? The pull on the bearings, on the stylus cantilever or is the pull down the armtube better in-line even if the stylus itself is slightly out? I have no idea at all – but just for the record (sic) I'll state that for me, if there's an option between a 9" and 12" version of the same arm I'd go for the 12" every time, and currently the V12 is the one I'd go for.